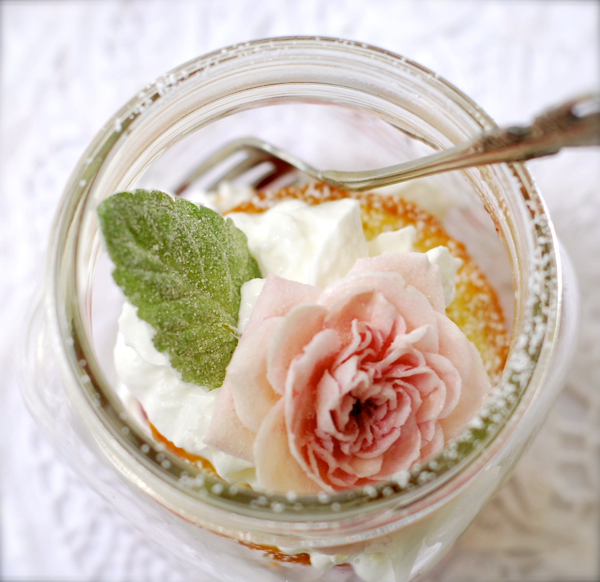 The beauty of the tea party to go is that all of these delicious treats can be packed into jars with tight fitting lids and kept on ice, in your cooler, until ready to serve. This makes taking a tea party along with you to someone’s home, to the park or on a little road trip both fun and easy! Generously butter a 6 cup muffin tin. Beat butter and sugar until fluffy. Add eggs, one at a time, beating well after each addition. Mix in water and almond extract and stir in until just combined. Add flour and baking powder and mix just until smooth and evenly incorporated. Fill the 6 buttered muffin cups about 2/3 full with the sponge cake batter. Bake in preheated oven until golden and a wooden skewer inserted into the center of a cupcake comes out with just a few crumbs stuck to it. Remove from oven and allow cakes to cool for 2 minutes before turning out onto a cooling rack to cool completely. Once cooled, split the cakes in half horizontally. 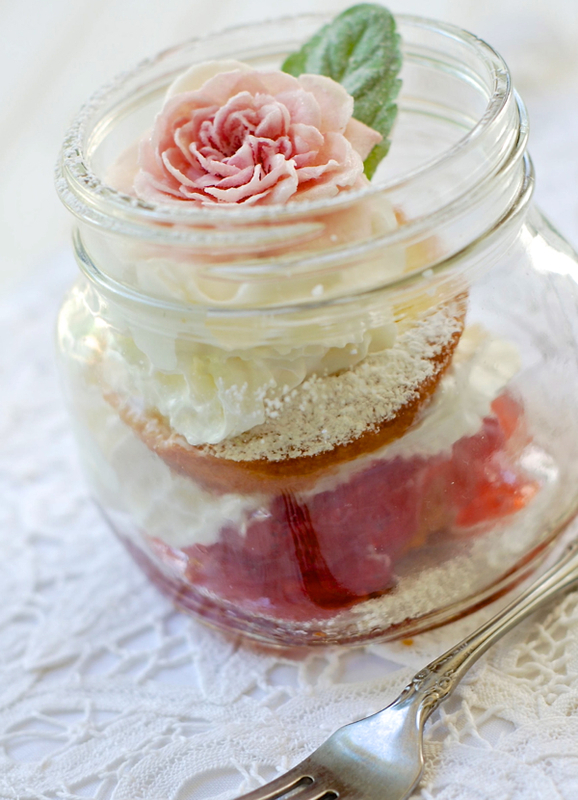 Place the bottom halves of the cakes in the bottoms of 6 wide mouth, pint sized Mason jars. Top bottom halves with 2 Tablespoons of jam each. Top the jam with the cupcake tops. Cover jars tightly using jar lids. Refrigerate, or pack on ice, until ready to serve. These little cakes will keep for about 4 hours in a refrigerator or cooler. Enjoy with a jar of iced tea or a jarred, iced Arnie Palmer!